Late last year I was rummaging through old Sanguine Hum recordings, cataloging tracks for inclusion in the retrospective release 'What We Ask Is Where We Begin'. Many of the archive recordings, squirrelled away on DVDs and hard drives, were initially intended to be included in the original 'Songs for Days' master but for reasons known more intimately to our younger selves Matt and I had decided not to release them at that time. Rewind even further to 2014 where the finishing touches were being added to 'Now We Have Light'. A relatively late alteration in the track 'Bubble Trouble' had been crafted by Matt to accommodate a brilliant vibes solo by vibraphonist Jim Heart. Then for some reason, Matt and I got a bee in our bonnets about strings. We were convinced that a string arrangement to accompany the new solo section was what the track needed to send the production stratospheric! So we drafted one string arrangement each and dropped the string parts into the mix to compare. Neither of the arrangements were sitting comfortably so we redrafted and tried again! This time we changed the sounds as well to see if that helped the strings sit more easily. The same nagging feeling that the part wasn't right was still looming so we redrafted and edited again! Eventually after all that work writing, redrafting and editing we came to the conclusion that what the track really needed was to be left alone! Sometimes the most creatively astute decision to be made is to just leave it out! This brings me back to my rummaging around to find tracks for 'What We Ask Is Where We Begin'. Inevitably the things we choose to leave out find their way into the world as part of another project and if indeed the part isn't right for the moment, then the idea should be tucked away in a quiet corner to wait its turn, when it might be just what you're looking for. 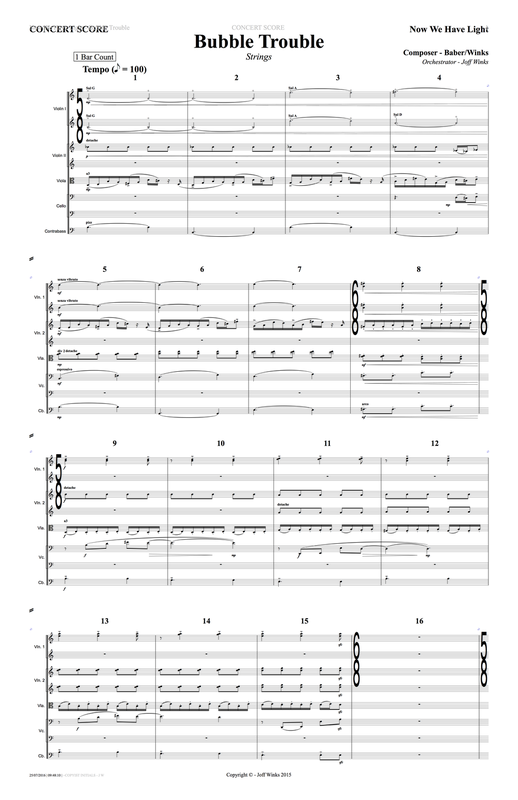 I recently listened back to my string arrangement for 'Bubble Trouble' and as a piece of writing I really enjoyed it. The score for the strings is below as is a midi mockup of the parts. For this mockup I decided to use the Vienna Symphonic Library Orchestral Strings library in combination with Cinesamples' CineStrings Core. I've used both libraries to exploit their particular virtues; where the VSL Orchestral Strings are much more nimble with an extensive range of detailed articulations the Cinesamples CineStrings Core library just sounds more realistic, owing mostly to the multi mic position sampling methodology, the quality of the Sony Pictures scoring stage acoustics, an impeccable signal path and the skills of a brilliant engineer, Dennis Sands. The Vienna Symphonic Library samples by contrast are recorded at 'The Silent Stage', a purpose built facility constructed to record the instruments in a consistent, relatively dry environment using just one mic position. The idea here being that the performance environment can be added to the signal path at a later stage with the addition of a convolution reverb. When using two different sample libraries together I find it useful to add additional reverb to the mix to help blend the different sound sources, effectively creating a shared space in which the instruments perform. For this mix I'm using Vienna Symphonic Library's Ensemble Pro mix host software, with the integrated MIR Pro convolution reverb engine and the Teldex studio impulses loaded from Roompack 2.